…and a finalist for The World Fantasy Award, and several other awards. A world like our own in every respect… save one: Beginning in the 1940’s, random acts of possession begin to occur. Ordinary men, women, and children are seized by entities that seem to spring from the depths of the collective unconscious—pop-culture avatars that some call demons. When Del Pierce was five years old, he was possessed by the entity called the Hellion. Twenty-three years later it’s back, trapped inside his head and clamoring to get out. He needs an exorcism, by any means necessary. The answers may lie in a handful of golden-age comics, a series of demon-created paintings, and his own childhood memories. More about the story. First chapter (pdf or html). Thanks to Pandemonium, I’ve won the 2009 Crawford Award, given each year by critics and scholars of the fantasy field to “an outstanding new fantasy writer whose first book was published the previous year.” More. Fictional Frontiers with Sohaib (the Philly radio show on WNJC-1360 AM) Listen to the full show, or download just my 15 minutes of radio fame (12mb MP3). Warning—I sound like I’m calling from a bus station. 5 Questions on Neth Space—the wackiest interview I’ve done yet. Hi. While researching the Palmarian Church I found your book on Google Books because you mention the church. I am wondering why you included it, where did you hear about this church etc. I am interested in all details. Thanks. Hi, James. I included the church because I was researching the life and shifting religious beliefs of Sinead O’Connor. 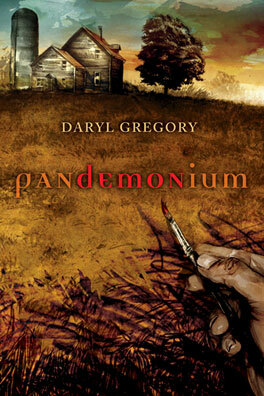 (There may be a resemblance between O’Connor and one of the main characters of Pandemonium.) At one point O’Connor was “ordained” in that sect (I use quotes because I’m not sure how official it was), but she seems to have later changed her mind about the church. I’m only about one-third of the way through Pandemonium, but I think this is the book that will cause me to immediately seek out the rest of your novels. I’ve read Raising Stony Mayhall and The Devil’s Alphabet, both of which I liked, but I’m loving this one! I think Harrison Squared is next (Dunwich! Lovecraft! ), or do you recommend reading We Are All Completely Fine first?